The follow-up to the 2008 hit! The new journey begins when young adventurer Sean (Josh Hutcherson) receives a coded distress signal from a mysterious island where no island should exist?a place of strange life forms, mountains of gold, deadly volcanoes, and more than one astonishing secret. Unable to stop him from going, Sean?s new stepfather (Dwayne Johnson) joins the quest. Together with a helicopter pilot (Luis Guzman) and his beautiful, strong-willed daughter (Vanessa Hudgens), they set out to find the island, rescue its lone inhabitant and escape before seismic shockwaves force the island under the sea and bury its treasures forever. Download Journey 2: The Mysterious Island in Digital HD from the iTunes store. 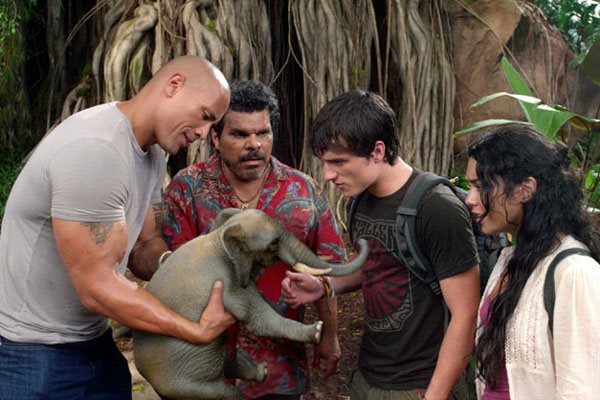 Journey 2: The Mysterious Island images are © New Line Cinema. All Rights Reserved. 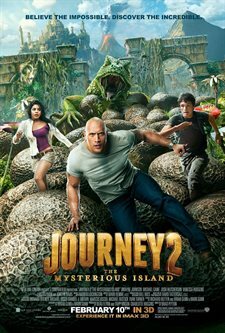 Journey 2: The Mysterious Island runs along the same format as the 2008 Journey to the Centre of the Earth. Josh Hutcherson comes back as Sean Anderson while Dwayne "The Rock" Johnson takes on the father figure or I should say step-father character Hank, while Michael Caine adds some class playing Sean's Grandfather Alexander. Sean obviously has the taste for adventure after his first outing and the movie opens with him being chased by the cops on his motorbike after breaking into a satellite tracking station, his reason, to get his hands on a coded message that he thinks originates from his grandfather. Unable to decode the message in his possession, luck is on his side when step father Hank uses skills he once learnt in the Navy to help decode the message and they both realise that Sean's grandfather is not only alive but he has found the fabled Island that Jules Verne wrote about so many years before. After managing to talk his mother into letting him go and find his grandfather, providing Hank goes along too, step-father and step-son set out to find the Mysterious Island, but getting there seems to be a problem and the only ones willing to risk the journey are Gabato (Luis Guzmán) and his daughter Kailani (Vanessa Hudgens) via a helicopter that has seen far better days. Still it does the job and gets everyone to the island, just. Once there it is quite apparent why this is called The Mysterious Island, elephants the size of dogs and lizard eggs the size of termite mounds, and it is after a chase through the forest by the mother of the eggs that Alexander saves the day and finds the party. From here on in its all about getting off the island, which as you can imagine, is not going to be the easiest thing to do. If you have seen the first movie the second does not hold many surprises, though this one is slightly better. The visuals of the island are superb but like the first movie it stops and starts, a bit of dialog and a chase, some humour is also in there and Luis Guzmán has some great one liners. All things considered this movie hits the target for the audiences it is aimed at, the family and if you have children that are pre-teen then I am sure they will enjoy it even more. Journey 2: The Mysterious Island images © New Line Cinema. All Rights Reserved.